The Lake Norman Chamber of Commerce saluted the men and women who work tirelessly to protect and serve the families and businesses of the Lake Norman region at a Public Safety Luncheon held at River Run Country Club in Davidson Thursday, October 18, 2012. The seventh annual event was keynoted by Kathryn Firmin-Sellers, PhD, the Region Director for United Family Services. Fermin-Sellers gave an update on the need for a North Mecklenburg Magistrate and the progress of a victim’s advocate which currently serves the three towns. She also presented the first 2012 Champion for Victim’s Rights to Inge Garrison from Presbyterian Hospital. Chamber president Bill Russell, emceed the event and spoke to the critical role the police, fire, and first responders play in making the community a great place to live and work. 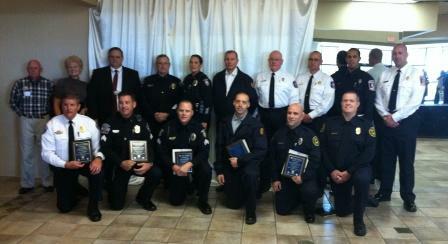 The Chamber presented awards to the most outstanding officer from each North Mecklenburg department, selected by their respective chief. The awards program was presented by Wells Fargo Bank and sponsored by Lake Norman Publications, Central Piedmont Community College, and Crime Stoppers. 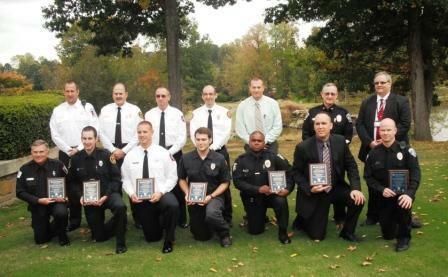 The Lake Norman Chamber Public Service Award recipients for 2012 included: Officer Matthew Sheppard- Cornelius Police Department, Officer Melvin Waller, Jr. – Police Department, Detective Tim Lesser – Huntersville Police Department, Firefighter E.J. McCormick – Cornelius Lemley Fire Rescue, Firefighter Matthew Jovic – Davidson Fire Department, Firefighter Brent Irvin – Huntersville Fire Department, and John “Koppy” Williams – North Mecklenburg Rescue Squad, Inc. The Crime Stopper of the Year was presented by Crime Stopper’s Chairman Tommy Davis who was also recognized by Cornelius Police Chief Bence Hoyle for his service to the region. This year’s recipient was Nancy McGahey. The Lake Norman Chamber represents approximately 900 businesses in the Cornelius, Davidson, Huntersville, and greater Lake Norman region. For more information about the Chamber visit LakeNormanChamber.org. The Lake Norman Chamber of Commerce will host the seventh annual salute to North Mecklenburg Public Safety officers and volunteers at a special luncheon Thursday, October 18th at the River Run Country Club in Davidson. The event presented by Wells Fargo Bank is sponsored by CPCC – Merancas Campus (Formerly North Campus), The Herald Weekly Newspaper, and Crime Stoppers. An officer from the Cornelius, Davidson, Huntersville Police Departments will be honored as well as members of the North Meck Rescue, the local fire departments, and Crime Stoppers. In addition to honoring the officers, the Guest Speaker will be Kathryn Fermin-Sellers, PhD, Region Director of United Family Services, who will give an update on the work being done by the UFS victim advocate in her first year and how that relates to the local communities ongoing efforts to bring a magistrate to the Lake Norman region. Registration is $16 for Chamber of Commerce members and $20 for non-members. Call the Chamber at 704-892-1922 to RSVP. 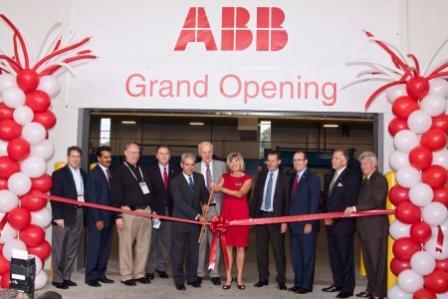 Charlotte’s Energy Hub expanded last week as ABB, the global leader in power and automation technology, celebrated the official grand opening of its high-voltage cable manufacturing facility in Huntersville, North Carolina. The new plant, topped off with a 430-foot extrusion tower, supplies high-voltage and extra high-voltage transmission cables, for both AC and DC applications, to carry massive amounts of electric power and renewable energy underground as part of the nation’s new Smart Grid. New AC and DC underground transmission lines will strengthen the North America energy infrastructure and enable power from remote renewable resources, like wind and solar, to reach homes and businesses. ABB has invested approximately $90 million in the new operation, which now employs around 135 people. Located in Commerce Station Business Park, ABB’s Huntersville plant is the newest addition to Charlotte’s new Energy Hub which aims to compete on the national level. By initially contributing more than $90 million to the local economy, ABB is helping Charlotte increase its role in the U.S. energy industry. The Huntersville facility will focus on regional, value-based customized production, and will tailor many of its products to meet the unique standards and needs of diverse utility customers across America. 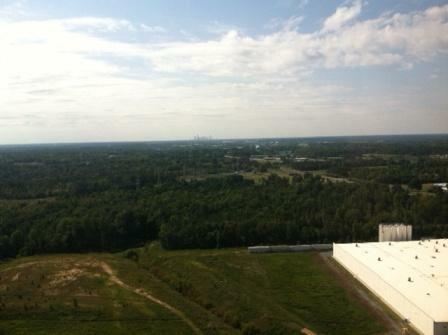 View from the top of the ABB Tower. Charlotte skyline in the background. “The top-notch talent from local universities and proximity to a modern transportation infrastructure, quality of life for our employees and a growing community made the decision to open a facility in Huntersville an easy one,” said Enrique Santacana, President and CEO of ABB Inc. and Region Manager for North America. Lake Norman Chamber President Bill Russell said the project is a sign of how area towns have been able to work together, and with other officials around the region. “ABB speaks to the collaboration between the towns, economic development agencies, Department of Commerce and the chamber. An investment by our business community and towns over a decade ago is paying off for a diversified tax base and great jobs,” he said. Tom Peters, Stephen Covey, Kenneth Blanchard, Brooks Lindsay….Brooks Lindsay? While the name Brooks Lindsay may not be recognizable as a leading authority on business acumen, mention “Joey the Clown” around those of us over 40 with roots in the Charlotte region and we remember the smiles he brought to children every afternoon on WSOC Television. Lindsay passed away six years ago this month, but not before he made a lasting impression on a generation of Charlotte children. I was one of those who had the opportunity to participate in a neighborhood buddy’s birthday party that was hosted at Joey’s “Clown Carnival”. Each little boy or girl had a chance at stardom when Joey let us introduce ourselves on his show. It was a really big deal for a kid to appear on the Joey the Clown Show and I can still recall all the family relatives who commented on my “first television gig”. One of the underlying principles of the Lake Norman Chamber of Commerce from its inception in 1987 is the concept of regionalism. More than two decades ago, business leaders from Cornelius, Davidson, and Huntersville began working together to foster the business growth and well-being of our region. Long before “regionalism” become a buzzword, Chamber leaders encouraged our political and community leaders to look past the rivalries and municipal boundaries that inhibited our growth as a region and as a community. It is natural for an elected official to protect his or her district. Politicians are rewarded for “bringing home the bacon.” However, we now live in a global economy and the markets of Asia and Europe dramatically impact the United States economy. Closer to home, a corporate business expanding in Davidson will impact the residents and businesses of Huntersville and a new company locating in Mooresville will benefit the Town of Cornelius. In 2001, the Lake Norman Chamber of Commerce commissioned an economic development study performed by the firm of Leake Goforth. The study made recommendations for the potential commercial growth of our region. Our 2000 Strategic Plan called for the Chamber to examine the possibility of creating an economic development authority and in 2002 we began lobbying the towns of Cornelius, Davidson, and Huntersville to consider creating a regional Economic Development Corporation (EDC). It wasn’t easy. The long time turf issue reared it’s head on many occasions, but at the end of the day, leaders in all three towns approved a public – private partnership spearheaded by the towns and the Lake Norman Chamber of Commerce. Today, the region is served by three regional economic development agencies: The Lake Norman Chamber, the Lake Norman Regional EDC, and Visit Lake Norman. All three work together to promote the economic growth and vitality of our region. If we are to succeed and prosper as a region – we must work together and support projects in other communities which will in turn benefit the citizens and businesses of neighboring communities. It’s as simple as that.